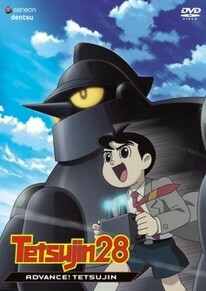 The late Professor Kaneda's Sun Bomb is discovered hidden inside of Tetsujin 28! This discovery upsets the entire nation, and a "Tetsujin Inquiry" is set to convene. Meanwhile, the rampage of the PX Syndicate puts Japan at risk of stalling its post war recovery. The only way to stop this mayhem is to boost Tetsujin's destructive capability by injecting the "bagume" into him. Shotaro does not want to transform Tetsujin into a weapon, but he knows he has to make a decision. DVD Features: Textless Closing for Episode 26, Anamorphic Widescreen.